Our in-house developed Augmented Reality browser Clic AR has been utilized for multiple applications such as : Image Recognition, 3D Overlay Rendering, Video Overlays, Animation Intents, Real world intents and Games. A translation App was built with Clic AR’s engine which captures real world textual images and replaces them with the pre selected language. 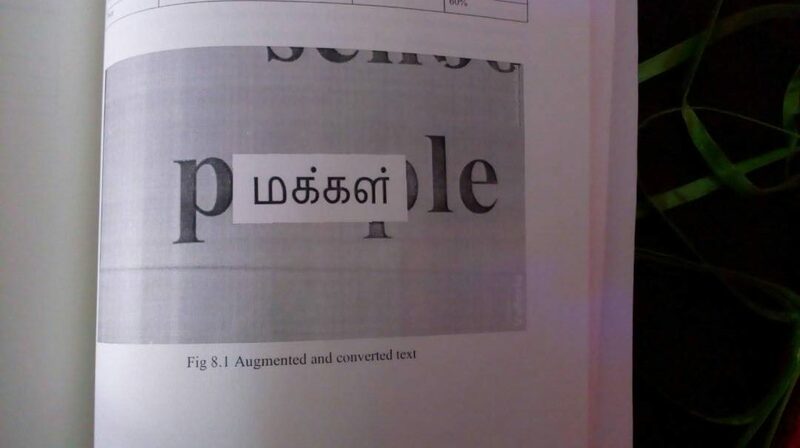 Our development was targeted towards south India’s regional language Tamil for a research project. Augmented reality has been a hot topic in software development circles for a number of years, but it’s getting renewed focus and attention with the release of products like Google Glass. Augmented reality is a technology that works on computer vision based recognition algorithms to augment sound, video, graphics and other sensor based inputs on real world objects using the camera of your device. It is a good way to render real world information and present it in an interactive way so that virtual elements become part of the real world. Augmented reality displays superimpose information in your field of view and can take you into a new world where the real and virtual worlds are tightly coupled. It is not just limited to desktop or mobile devices. As mentioned, Google Glass, a wearable computer with optical head-mounted display, is a perfect example. A simple augmented reality use case is: a user captures the image of a real-world object, and the underlying platform detects a marker, which triggers it to add a virtual object on top of the real-world image and displays on your camera screen. AR applications can become the backbone of the education industry. Apps are being developed which embed text, images, and videos, as well as real–world curriculums. Printing and advertising industries are developing apps to display digital content on top of real world magazines. With help of AR, travelers can access real-time information of historical places just by pointing their camera viewfinder to subjects. AR is helpful in development of translation apps that can interpret text in other languages for you. Location based AR apps are major forms of AR apps. Users can access information about nearest places relative to current location. They can get information about places and choose based on user reviews. With the help of Unity 3d Engine, AR is being used to develop real-time 3D Games. It is estimated that 2.5 billion AR apps will be downloaded annually and will generate revenue of more than $1.5 billion by 2018. This is because AR apps will not be limited to conventional mobile apps. There will be new markets like Google Glass which will open more forms of development and use.